Already an established sculptor of some standing, selling her original sculptures I believe in her own gallery in Belgium, her work has brought something fresh and different to the limited edition sculpture market. 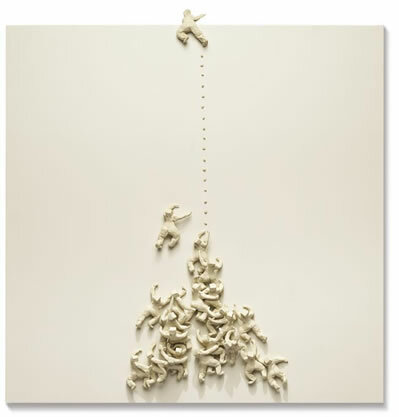 With the unique design to here figures â€˜in action,’ whether climbing up a ladder, a rope or escaping, they are a talking point from the moment I laid eyes on them and doubtless will be for galleries who stock her work and customers who hang them on their walls. 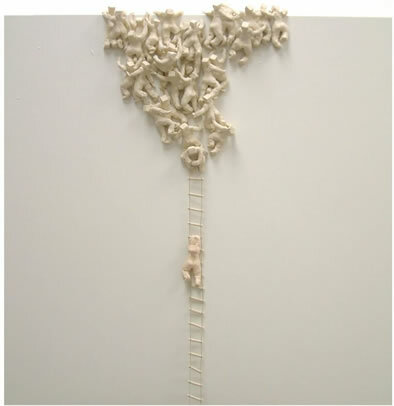 Her distinctive ‘Bo-men’ figures are seen scaling the heights of 4 ‘boxed wall sculptures’ and a unique perspex enclosed sculpture: â€˜Belongingâ€™ – which is my personal favourites. For Spring 2007 a further 5 sculptures were released and these 5 follow the same theme as some of her previous work, 5 different work produced on a 34â€™â€™ inch square background or ‘boxed wall sculptures’ with her sculptures scaling this background. When I first encountered Daisy Boman’s work I found them to be very amusing, cheerful and naive to some extent but as I read more about the artist, I realized there was a deeper significance to her work. I personally interpret them as describing the struggle that is the human condition, and that we too, like the Boman characters, will win in the end. All credit must go the publisher Washington Green, again finding and bringing something unique to the UK and International limited edition art market. These sculptures are very low edition numbers of 95 each and can be bought from only a few select galleries, I can personally recommend www.chelmerfineart.com if u want to view or buy her collection.